For as long as I can remember, I've always had a thing for the small “hot hatch” cars. 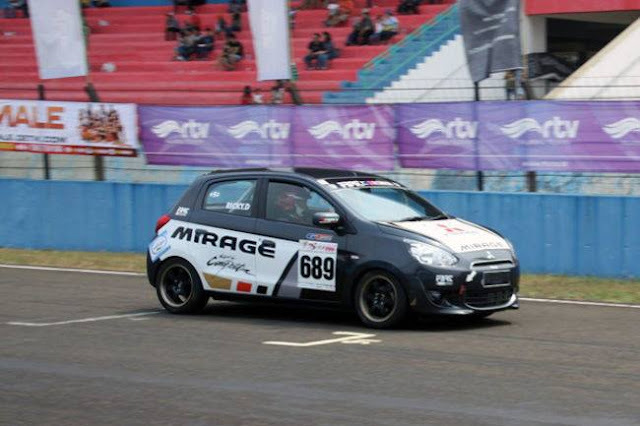 It started with cars like the Volkswagen Rabbit GTI, Dodge Omni GLH, Suzuki Swift GT, and the Chevrolet Sprint Turbo. In their base forms they aren't necessarily the most exciting cars. But with the right combination driving dynamics and character, they become cars that are choked full-o-fun. And while they may not be the fastest vehicles on the road, they possess certain traits that make them entertaining. Each one of these cars is a wee bit quirky, and they aren't for everyone. 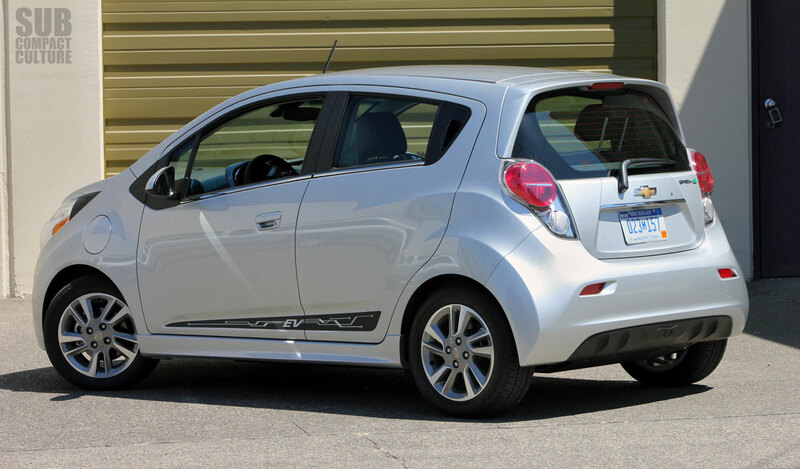 Chevrolet’s new Spark EV is also one of these cars, and it’s all electric. And while it may seem outlandish to consider an electric Chevrolet Spark to be a hot hatch, my time behind the wheel made me realize that this tiny five-door has many of the characters the aforementioned fun hatches. 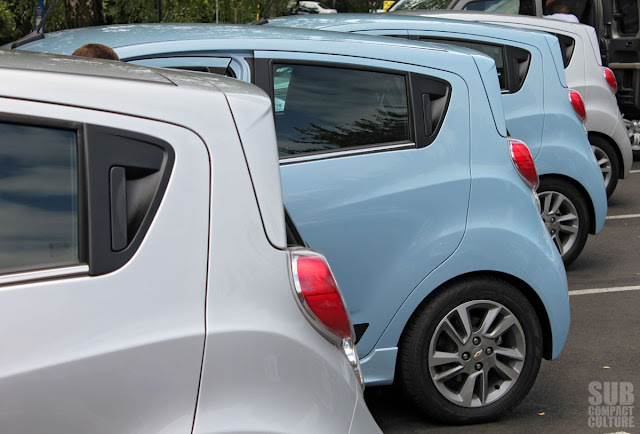 There are a few visual differences between the Spark EV and the gas-powered Spark. The rear valence is different and incorporates a tasteful diffuser. The car sits a little lower and has a lower center of gravity, and has unique wheels. 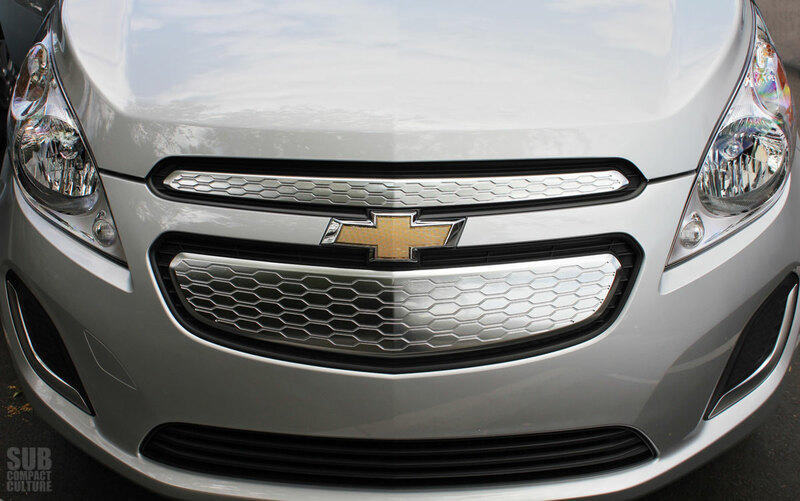 Up front, Chevrolet gives the Spark EV a similar grille treatment as the Volt—silver shield-like inserts that distinguish it from a gas-burning Spark, but also associates it with Chevy's other EV. Other than that, this A-segment EV does not scream “look at me, I’m saving the planet by driving electric,” which I think is great. OK, enough about that. Remember that hot-hatch thing I was talking about? 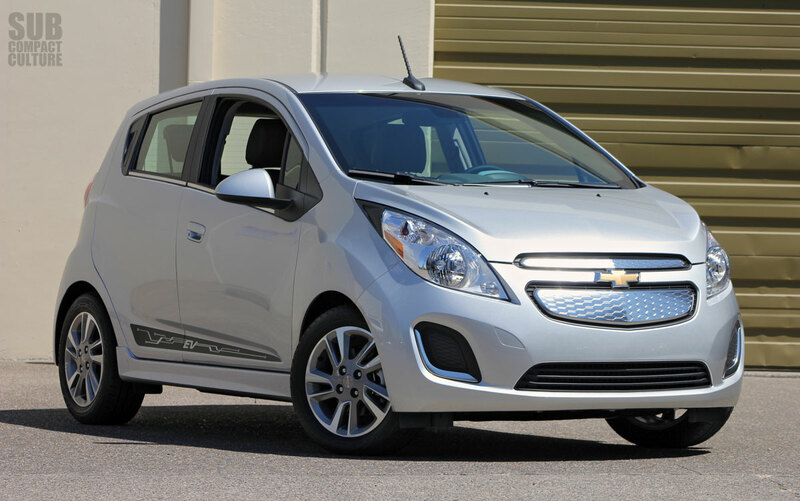 Chevrolet is quick to point out the Spark EV’s torque output of 400 ft/lbs. The company is also quick to point out the motor makes more torque than a Ferrari 458 Itallia. However, the 140 horsepower it produces is not quite up to Ferrari levels. The Spark EV, battery packs and all, weigh in at 2,967 lbs. So what does this mean in terms of performance? Chevy claims the Spark EV will do 0-60 in 7.6 seconds, making it the fastest of comparable EVs. That’s great. However, what’s it like to actually drive it? Let’s start from the beginning. You get in the Spark EV, and it’s very similar to a regular Spark. There seems to be the same amount of room in the front and rear seats, same amount of storage, etc. I’m not going to get into all the infotainment fun, the cool apps, the swank amenities, etc. You can read my 2013 Chevrolet Spark 2LT review for all that, since it applies here, too. Anyhow,the big change is the LCD gauge cluster, which is totally different than the gas version's gauges. It displays speed, battery charge, range and a host of other information. The car also has push-button starting and keyless ignition. Simply press the large illuminated blue button to turn the vehicle on. Put it into gear, and you can zoom (whir?) off. Put your foot to the floor and sure enough, this little thing has some significant grunt. There’s noticeable torque steer, not surprising with 400 ft/lbs of torquey goodness to the front wheels, but it’s controllable. The Spark EV can bark the front wheels from a standstill, but the car’s thrust is most apparent from a rolling start. The 10–50 MPH jaunt is quite remarkable. You won’t believe how fast you’re going until you start passing other motorists and they start wondering why the dude in the Spark is driving so fast. There is a sport mode that recalibrates the throttle for better response, and it is noticeable. Also impressive is the car's low NVH (noise, vibration, harshness) levels. Of course, there’s no exhaust or engine noise, but road and wind noise are also minimal. The ride is unexpectedly compliant. Like its fossil-fuel-burning fraternal twin, the Spark EV is very maneuverable. 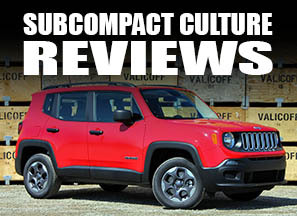 It easily darts in and out of city traffic and is a cinch to park. Like it’s cousin, the Volt, flash your highbeams, and the horn lets out a few short chirps—great for scaring pedestrians—er making pedestrians aware of your silent presence. All kidding aside, the Spark EV is a great city car but still quite smooth on freeway trips. The least “hot” thing about this hot hatch EV is the handling, and most of that is a result of the 195/55/15 low-rolling resistance Bridgestone tires. While they help the car achieve 128 MPGe city and 109 MPGe highway, they don’t do squat for handling. When driven through the corners in an enthusiastic fashion, the tires are quick to give out and the traction control is quick to kick in. Nothing some stickier tires couldn't fix (and there are plenty in that size). In addition, you get the awkward brake feel that so many EVs and hybrids possess. But you know what? Despite the tires and weird brake feel, the car is a blast to drive; certainly more so than the Nissan Leaf or Mitsubishi i-MiEV. So how far can you go with all this fun? About 80 miles, which is more than enough for the majority of American commuters according to Chevrolet, which says the average American commute is 20 miles a day. And while initially you may think 80 miles isn't that far, think about your commute. Personally, I travel almost exactly 20 miles round trip, so that’d allow me plenty of wiggle room for errands at lunch or after work. I realize this won’t suffice for everyone, but it will work for quite a few people. I know what you’re wondering. How long will it take to charge? It depends. On standard 110V household current, it takes 20 hours from an emptied battery. If you have a 240V charger installed at your residence, charge times drop to seven hours from a drained battery pack. (Chevrolet is offering a $500 discount on its 240V home charging system, too. Bosch charging systems go from about $949 to $1,095 USD.) Chevy is quick to point out most people do not fully empty the battery, by the way. In the next few months, there will also be a DC fast-charge option that allows users to go from an empty battery pack to 80% charge in only 20 minutes. This will be a $750 option when it becomes available in the next couple of months. But, you’ll need to find a place that has these DC fast chargers if you want to take advantage of this option. Keep in mind, Chevrolet says 90% of all EV charging is done at home. One last thing about charging: The Spark EV does have regenerative braking, and there is an "L" gear that kicks up that regenerative braking when you let off the throttle. Most EVs have this mode nowadays, but the Spark EV's has a more noticeable drag when you're off the gas ... er ... volts. 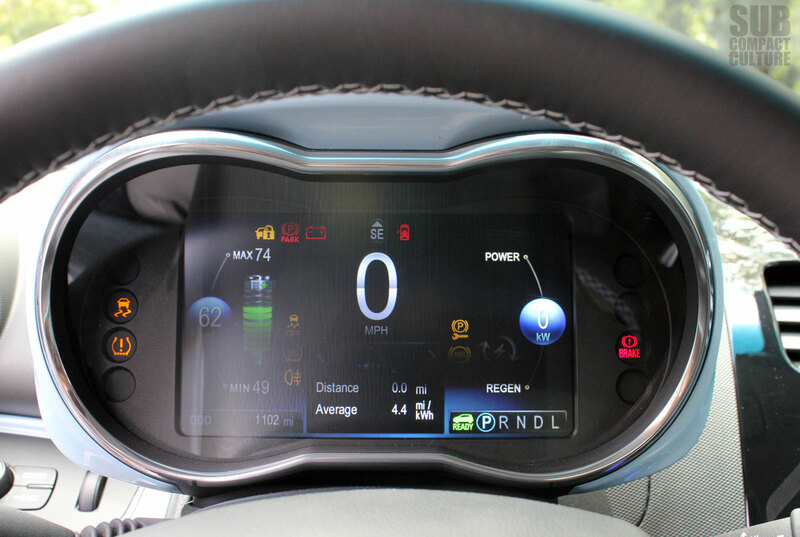 How much will a Chevy Spark EV set you back? Well, unless you live in California or Oregon, it really doesn't matter since the car won't be for sale there, as Chevrolet is planning on sticking to key “influencer” states at this point. (Canada, China, and South Korea will eventually get this car, too.) Assuming you do live in California or Oregon, the starting price is right around $27,000. Woah! It’s $27K for a Chevy Spark EV? Well, that’s before the available $7,500 in tax breaks, which then brings the car under $20,000—quite a bit more reasonable. What’s more appealing to me is the lease deal: Put $999 down, and you’ll pay $199 a month for three years. A mileage cap of 12,000 miles is in place. I was really impressed with the Spark EV; quite a bit more than I thought I’d be. I’m not just saying that because Chevy bought me dinner and lunch (that's full disclosure here, people). I could actually see owning or leasing one of these if our Toyota Yaris got struck by a large meteor or something. The Spark feels well-built and solid; it’s a ton of fun to drive; it’s got enough amenities and space for any commuter; and it doesn't announce that you’re trying to be “eco-chic” to the rest of the world. Oh, and there’s that 400 ft/lbs of torque thing, again, too. I applaud the folks at Chevy for their efforts on the Spark EV. They've created an affordable, truly fun hot hatch with personality and spirit that also happens to not use any gasoline. It’s the first EV I've driven that I’d actually consider putting in my driveway for more than a week. Nice review. We have one, and it's proving to be a hit for our family needs. You should mention the EV in your other posts about the Spark!